With the 2016 season just around the corner, it’s time to really hunker down and prepare for your upcoming draft. Here we are now, with the best idea of what starting backfields will look like across the league before training camp. Coaching changes, game plan philosophies, offensive lines, plus new additions through free agency and the NFL Draft are all taken into account as we rank the Top 40 running backs by priority in which you should be drafting them. Le’Veon Bell takes the #1 spot because when he’s right, he is the best offensive football player in the league. 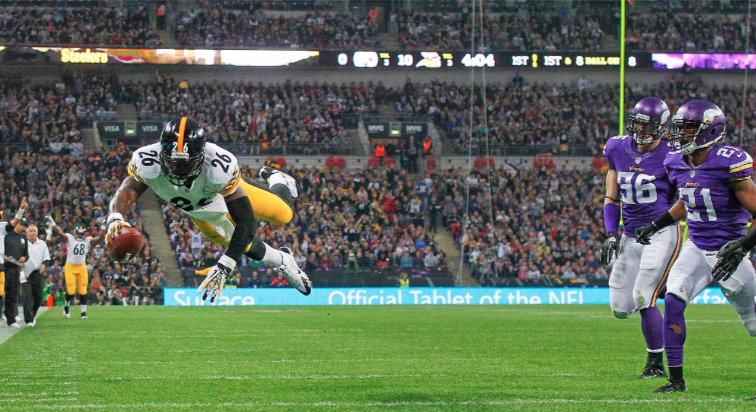 Both on the ground and in the air, Bell does it all. His 2014 season was proof of that as he totaled 2,215 yards from scrimmage (1,361 rushing, 854 receiving), 11 touchdowns and 83 catches. In the 6 games Bell played before his 2015-ending injury, he averaged 115 yards and scored 6 touchdowns. Though his injury history is worth the concern, his motivation this year seems to be the next big pay day, which he has made note of multiple times this summer. A player that is hungry to earn more money than anyone else at his position is usually a good one to bet on. 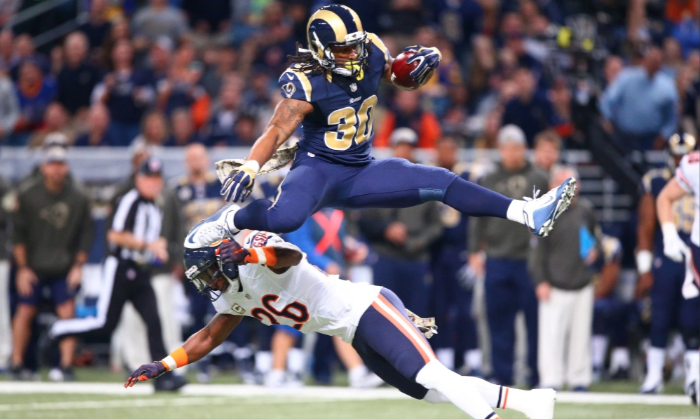 Besides the freakish talent, athleticism and stats from his rookie year (1,106 yards and 10 touchdowns in 12 games), another thing Todd Gurley has going for him will be usage in the upcoming season. The Rams offense hasn’t improved much in the offseason outside of #1 overall pick Jared Goff. Whether it’s Goff or Nick Foles under center, both will be giving Gurley a high volume of reps on all-three downs in order to move the ball. 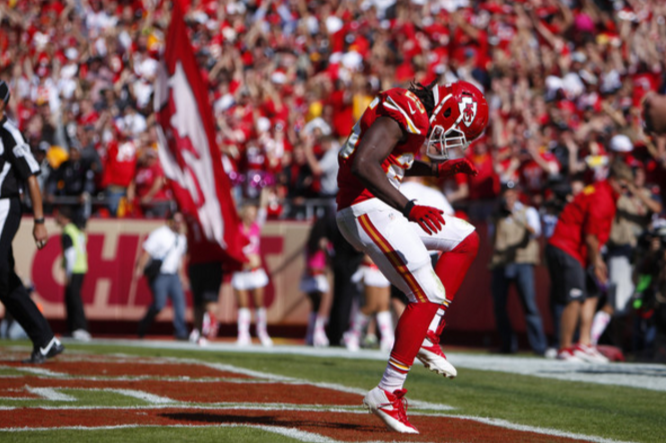 I give Jamaal Charles a a slight edge over Adrian Peterson for the simple fact that he has a little more tread on the tires, despite and because of 2 season-ending. Before the 2015 season, Charles was a production machine. He totaled 5,049 yards and 39 touchdowns over the previous 3 seasons. Yes, another injury would be devastating, but the ceiling for a healthy Charles is too high to deny. Adrian Peterson has posted 10+ touchdown in 8 of the 9 seasons he has played, and has also averaged 1,689 yards from scrimmage in each of those seasons. You can’t expect him to give you receiving points anymore and he only plays on the first 2 downs, but even at age 31 you can’t let him go out of your first round. The Vikings have improved their line as well, and the only reason I don’t have him higher is because he is on the wrong side of 30. David Johnson (I refer to him as DJ2K) is going ridiculously high in most mock drafts for his incredibly high ceiling in the Arizona Cardinals offense. From the RB3 spot in their backfield, Johnson scored 6 touchdowns in his first 5 games. 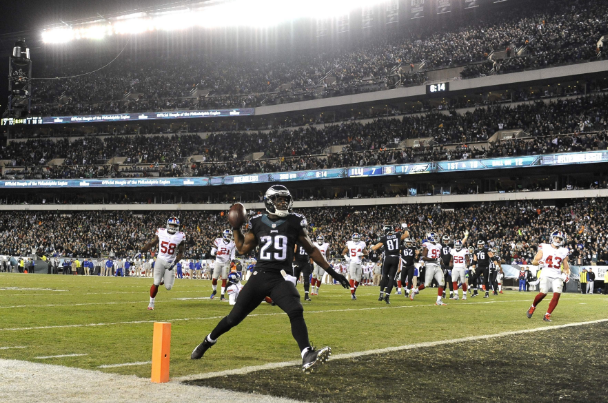 When given #1 reps, Johnson showed you why he is rated so high, most notably Week 14 against Philadelphia…29 carries for 187 yards, 3 touchdowns + 4 catches for 42 yards. 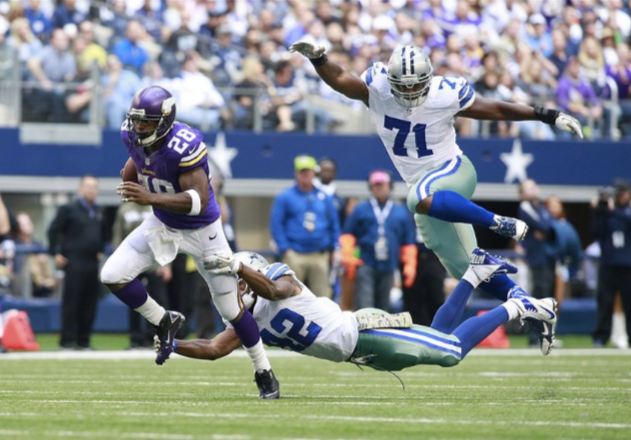 Ezekiel Elliott couldn’t have landed in a better situation. He’ll be running behind one of the Top 2 offensive lines in the league…in a system that works best in play-action…with a quarterback who loves to check down. 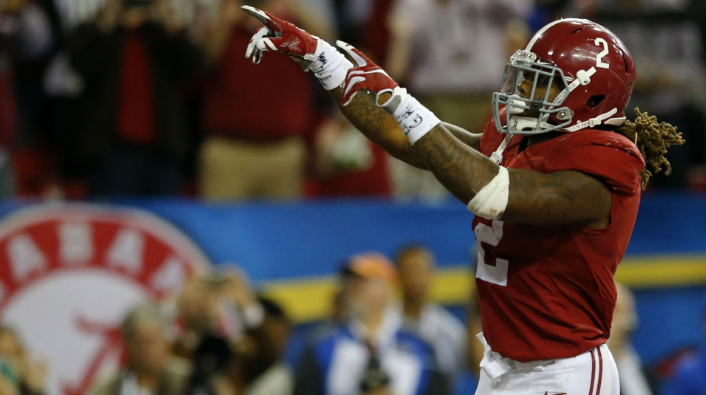 He isn’t afraid of the big stage, from what college fans saw him do against both Alabama and Oregon in the 2014-2015 College Football Playoffs. 41 touchdowns in his last 2 years at Ohio State shouldn’t be ignored either. 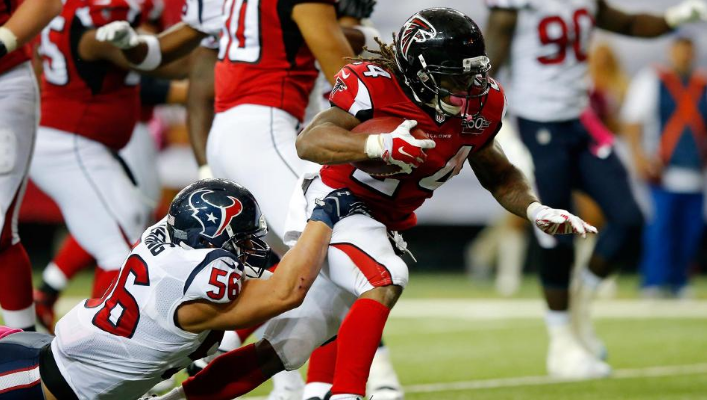 In 13 starts, Devonta Freeman ranked 1st in total touchdowns, 5th in yards from scrimmage, 7th in rushing and 2nd in touches. He will have new Falcon/Pro Bowl center Alex Mack to run behind in 2016. Tevin Coleman should still get some reps, but look for Freeman to be even more dangerous around the end zone this year. 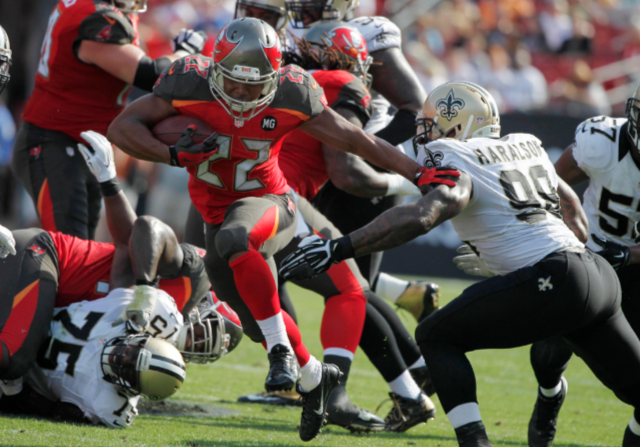 Doug Martin answered a ton of questions I had a year ago, including those regarding his health. It was the first time since his rookie year that Martin played all 16 games. 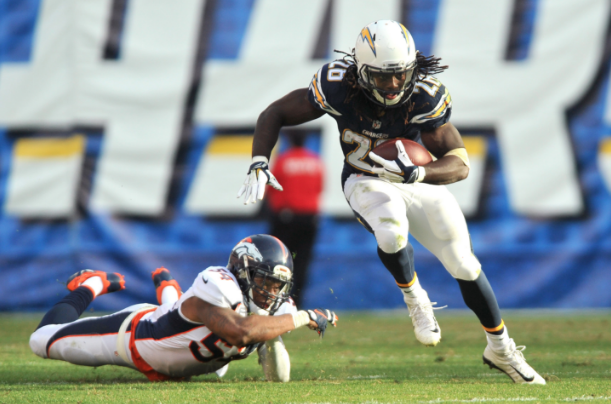 While the numbers didn’t quite match those of 2012, he still ranked 2nd in rush yards and 4th in yards from scrimmage. Hopefully former OC Dirk Koetter, now at the helm, will help Martin break the plain of the end zone more often. Lamar Miller was such a curious case in 2015. 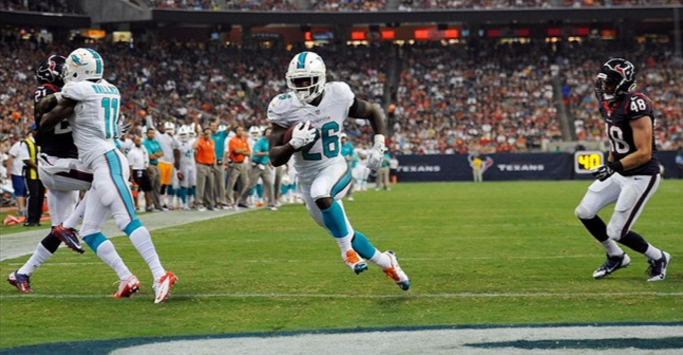 The Dolphins were 6-1 when Miller got 13+ carries and winless when he didn’t. You can expect Bill O’Brien to give the 25-year-old plenty of action in his new digs. In the same system, Arian Foster recorded 1,573 yards from scrimmage and 13 touchdowns in 2014. Miller, who has 19 touchdowns in the past 2 season, is much younger and faster than Foster was then. Fantasy owners should prepare for a monster year out of him. 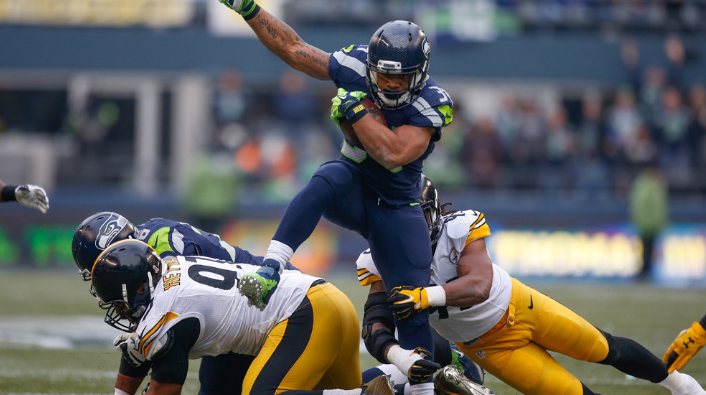 In 6 starts last season, Thomas Rawls averaged 118.6 yards per game and scored 5 touchdowns. The Seahawks are ready to roll with Rawls as their #1 in the backfield and he should be an absolute force if he can stay healthy. 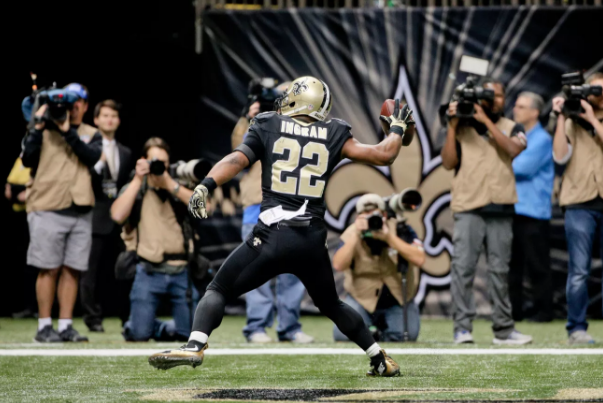 Mark Ingram stepped up big for the Saints and Fantasy owners in 2015. He recorded career highs in yards from scrimmage, targets, receptions, and receiving yards. Proving he could be effective in the passing game made Ingram incredibly valuable in between the 20s, and he should build on that momentum within the red zone as well. 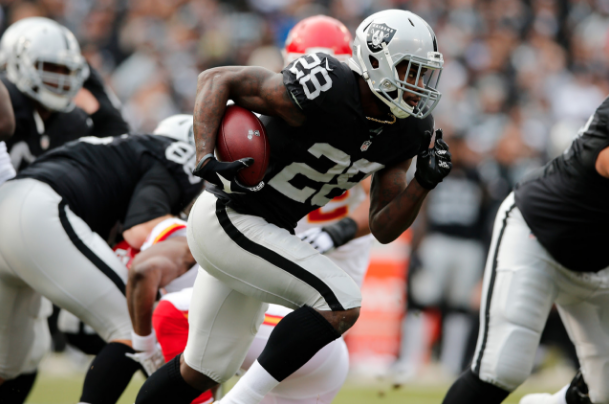 I may be a bigger fan of Latavius Murray than most, but I do believe he’ll be running behind arguably the best offensive line in football and the Raiders receivers will keep defenses on their heels. I also like how much usage Murray got in 2015, ranking 4th in touches, 3rd in carries and 6th in rush yards. If there was one takeaway from the Panthers’ offseason, besides saying goodbye to Josh Norman, was their commitment to the run, as their notable moves were extending fullback Mike Tolbert and guard Chris Scott. 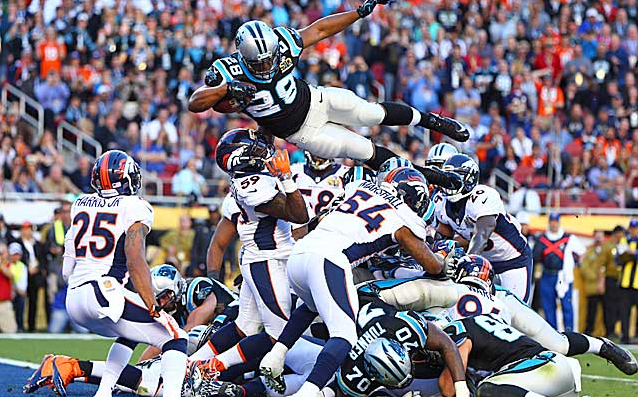 In order to preserve Cam Newton, the MOST VALUABLE PLAYER in the league, the Panthers will want to utilize Jonathan Stewart in the run game. From weeks 5-12, Stewart had 20+ carries in each game, averaging 86.7 yards per game and scored 6 touchdowns in that span (plus another the week after). 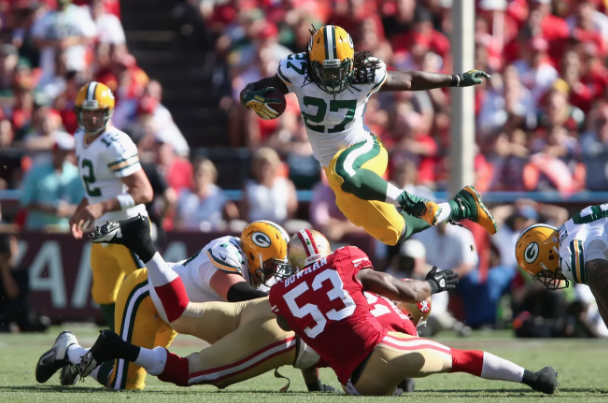 I have not bought into the Eddie Lacy hype, which is all based on his fitness, but the prospects of the Packers returning to their typical offensive form makes me optimistic. With the caveat being Jordy Nelson bringing back some normalcy for Aaron Rodgers, which allows everyone else (including Randall Cobb) to fall back into their roles, Lacy and the run game could be set up to take advantage of defenses that are too focused on covering deep passes. Maybe then Lacy will look like the back that recorded back-to-back 1,100+ rushing seasons and 20 touchdowns to start his career and NOT the one that was benched based on merit. I am not totally sure how LeSean McCoy was named to the Pro Bowl last year, but recording EXACTLY 112 yards rushing in 3 of the 5 games from Weeks 6-10 might have something to do with it. 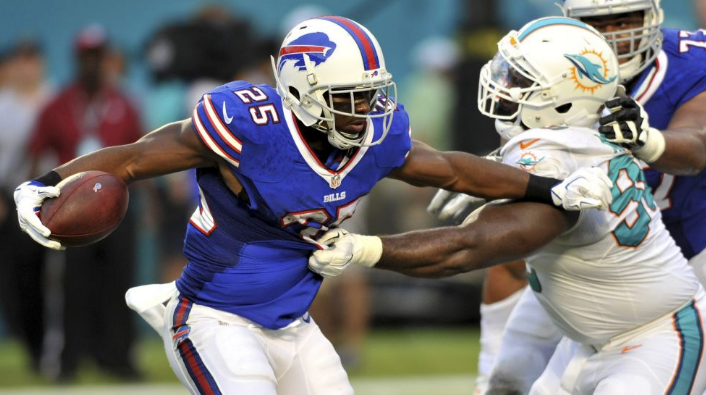 Hopefully Shady’s 2nd year in Buffalo will be more productive but it’s starting to feel like the back-to-back seasons of 310+ carries prior are catching up to him. His value in the passing game can’t be overlooked as he continues to build chemistry with Tyrod Taylor on play-action and 3rd down. You have to appreciate the love C.J. Anderson got from others in the league, including Tom Brady, after shining in the playoffs and Super Bowl. He was a great story when he broke out in 2014 and even better when he averaged 80.4 yards and scored 4 touchdowns in his last 5 games (end of regular season until he lifted the Lombardi trophy). Then the Broncos awarded Anderson for his efforts by matching Miami’s offer sheet. No question, he’ll be depended on in high volume as the Denver offense transitions from the post-Manning/Osweiler era. 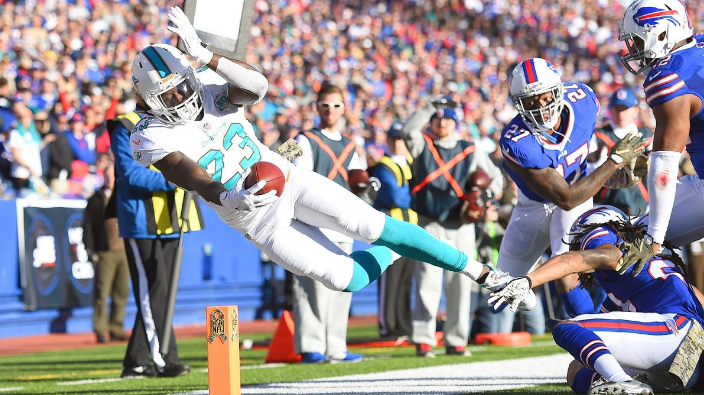 If you’ve been following along, this is big jump for Jay Ajayi. He was ranked 40th in the last version of these rankings because I wasn’t sure if Miami would give him more competition. The closest thing to real competition appears to be their 73rd overall pick, Kenyan Drake from Alabama, but he appears destined for 3rd down and change-of-pace status in the immediate future. So that makes Ajayi the new Frankenstein running back for Adam Gase, and you can look at Matt Forte, CJ Anderson, and Knowshon Moreno as references for success. This should also give you some Ajayi optimism…sorta. 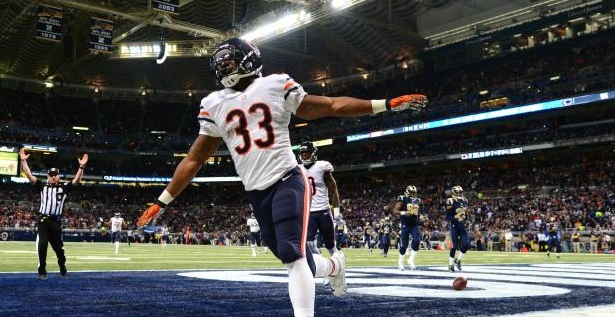 Speaking of Matt Forte, it’s going to be so weird to see him a uniform that isn’t navy and orange. 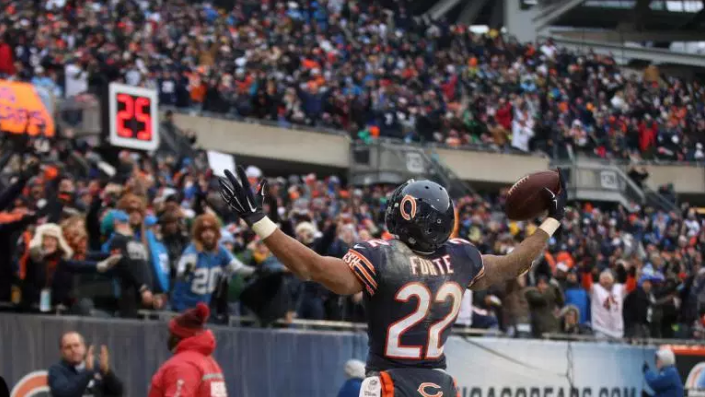 After concluding a tenure in Chicago that is considered only behind Hall of Famers Walter Payton and Gale Sayers, Forte is now a New York Jet. He’s the football definition of an all-around athlete (running, blocking, catching, even passing) and averages 1,589 yards from scrimmage per season. The hope was that he could be a role player for a championship ready team, but the Jets seem to have taken a step back from continuity by not bringing Ryan Fitzpatrick back. Based on circumstance, Forte could get a ton of touches running and catching from any of the Jets QB contingent (Smith, Petty, Hackenberg). It’s so hard to rely on New England Patriots running backs because Bill Belichick is so unpredictable in who he wants to use. 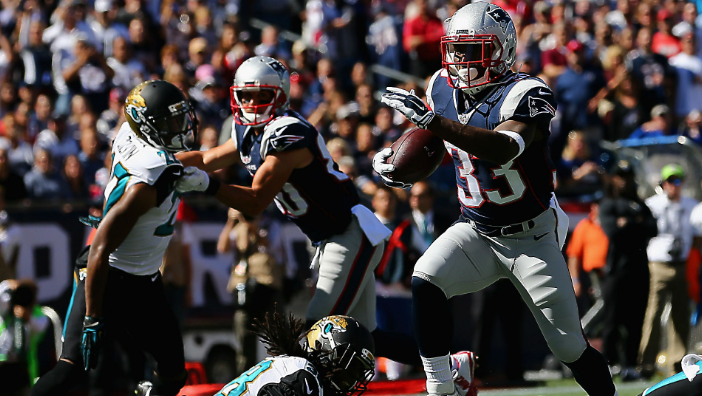 However, he seems to have found a lethal weapon in Dion Lewis, who broke onto the scene in 2015 with 4 touchdowns in 6 games before a season-ending injury. Lewis’ nose for the end zone and versatility in the pass game made the Patriots confident enough to extend his contract during the season too. With Jimmy Garoppolo likely starting the first 4 games of the season, expect him to rely heavily on Lewis in both the run and passing game. It pains me to drop Jeremy Langford in these rankings, but the drafting of Indiana running back Jordan Howard makes his status as a bell-cow back a bit less likely. In both Denver and Carolina, John Fox had always gone with the hot-hand in the running game and that could push Langford elevate his play in training camp, then carry it over to the regular season. This is the one backfield situation that you’ll want to keep an eye on before the season starts, as Langford has his leg up on the competition. Whoever gets the starting job though will be getting TONS of work, as we saw in 2015. The 49ers brought in Chip Kelly as their new head coach and that was really the only change they made on the offensive side of the ball. That also means zero real competition for Carlos Hyde as the #1 running back on the depth chart (save your Shaun Draughn responses, unless he wins the job). 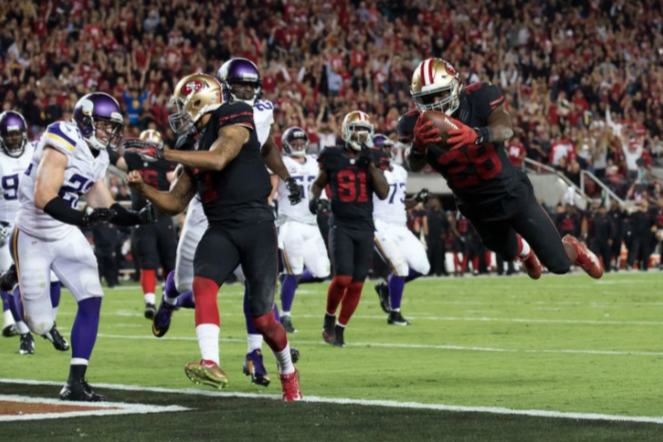 Hyde had a very promising start to 2015, rushing for 168 yards and scoring 2 touchdowns, but then adversity and injuries ended any optimism for the 49ers and his season by Week 7. 2016 will be a serious PROVE IT year for both Hyde and Kelly. 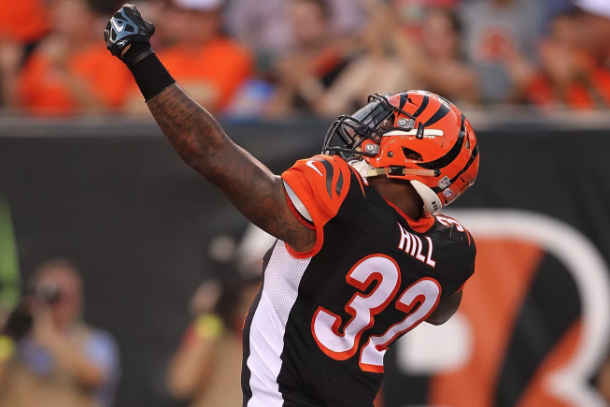 Like Hyde, Jeremy Hill started 2015 with tons of promise by awarding those who drafted him high with 2 touchdowns. Then he frustrated them with immense inconsistency until Week 10, despite a 3 TD performance in Week 4 (good for you, if you started him). We found out down the stretch that Hill’s game does not translate particularly well between the 20’s but can be devastating in the red zone. He scored 11 of his 12 touchdowns from within 10 yards of the end zone. Maybe the touchdown totals should have him ranked higher, but his split-back status should give you pause to draft him high. 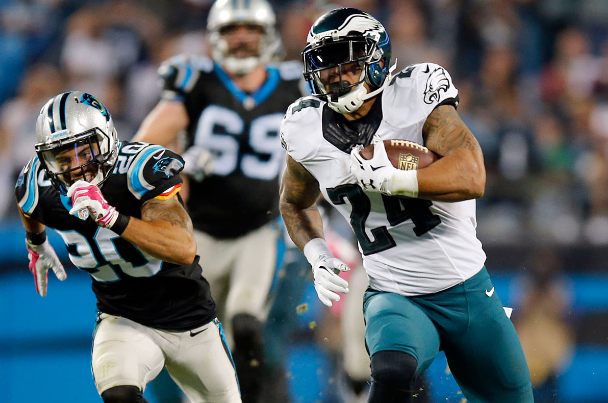 Without question, Ryan Mathews is the starting running back in Doug Peterson’s new Eagles offense, designating Darren Sproles to 3rd down and special teams situations. The 2011 Pro Bowler filled in fine when DeMarco Murray went missing, scoring 6 touchdowns in 13 games and averaging 5 yards per carry. The Eagles were a complete mess though, for a lot of 2015, and Peterson brings are well-structured running game that made Charcandrick West and Spencer Ware into viable fantasy options last season. DeMarco Murray made the Cowboys relevant on the field again, with Pro Bowl seasons in 2013 and ’14, but fell into something weird in Philadelphia in 2015. Now he has a chance to get back to that level in 2016 with the run-happy Tennessee Titans. The question is how much use will he get in a backfield that includes receiving back Dexter McCluster and reigning Heisman winner Derrick Henry. 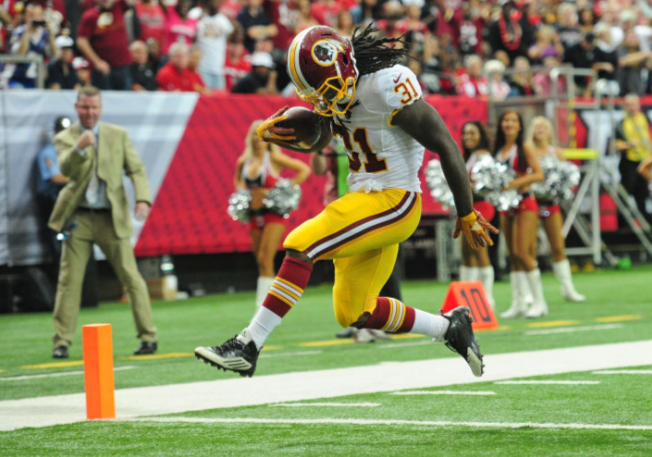 High on the over-valued list is Matt Jones, who has assumed the #1 running back role in Washington with Alfred Morris now in Dallas. In 13 games last year, Jones scored just 4 touchdowns (3 rush and 1 receiving). Their offense was clicking much more when Kirk Cousins was finding his receivers deep and Jordan Reed in the end zone. Perhaps another year in the system and confidence from coach Jay Gruden will award Jones more opportunities, especially in the red zone. 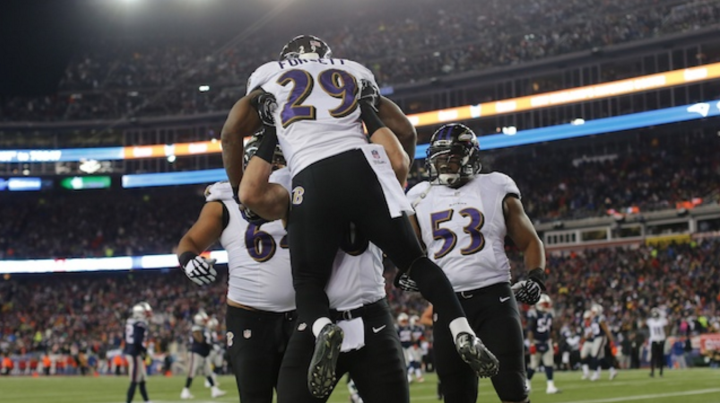 Justin Forsett was one of the best stories of 2014, filling the void Ray Rice left by earning his first Pro Bowl invitation and recording career highs in total yards (1,529), touchdowns (8) and receptions (44). The Ravens offense hit a serious snag as both Forsett and Joe Flacco went down after 10 games. Forsett can bounce back and return to being the a Fantasy force again, but he will have Javorius Allen and rookie Kenneth Dixon to ready step in if he can’t. TJ Yeldon was steady in his rookie season, but never put together the monster game that people expected. The Jaguars were regularly playing from behind and were forced to pass most of the time. While the addition of Chris Ivory may appear as a bad sign for Yeldon’s reps, it could actually prove to be the opposite. Yeldon will be forced to earn a starting role in camp, could learn from the veteran back, and will be depended on more in passing downs. 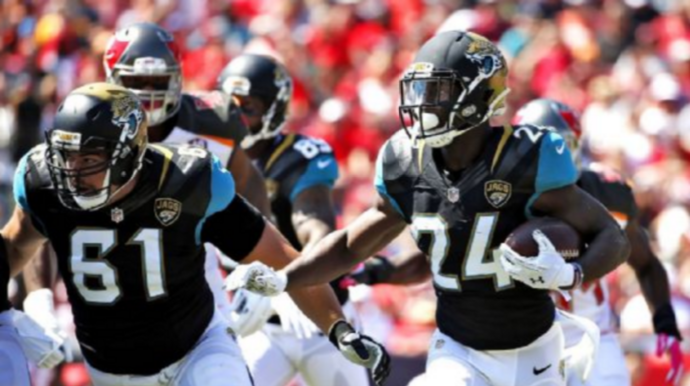 If the Jaguars’ passing attack can strike first against opponents, they’ll be able to control the clock and pace with Yeldon carrying the rock. For as long as Philip Rivers is playing quarterback and head coach Mike McCoy is influencing the Chargers offense, Danny Woodhead will be a fixture in Fantasy Football. 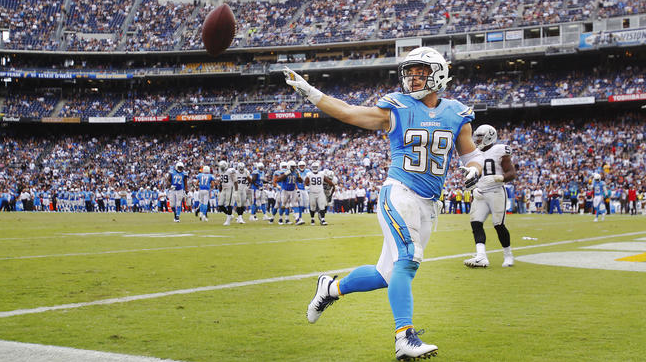 The Chargers don’t have a vaunted defense and it’s hard to expect that Melvin Gordon will bounce back, but you can plan for Woodhead to get plenty of attention from the quarterback who threw more passes than anyone last season. 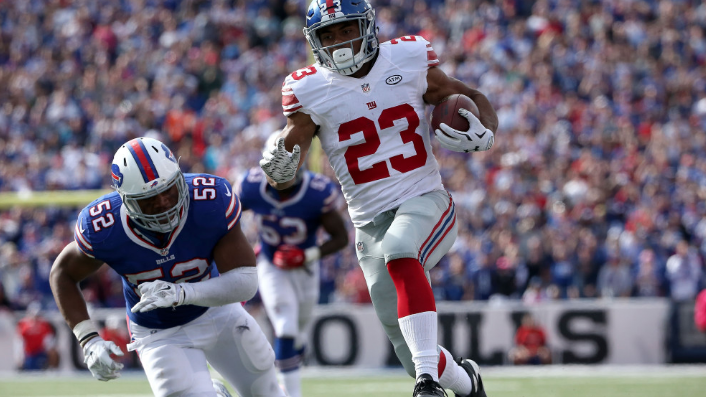 Rashad Jennings had his most productive season in New York last year. He totaled 1,159 yards from scrimmage and had a serious uptick in rush attempts, but only hit pay dirt 4 times all season. The Giants are better known for throwing the ball and Shane Vereen had twice as many targets as Jennings (81 to 40). For now, though, Jennings is their #1 back. 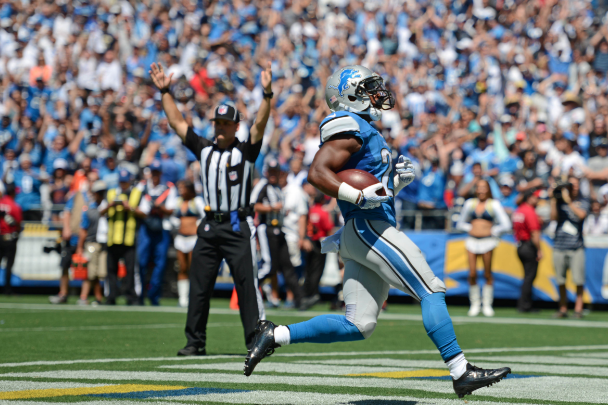 Ameer Abdullah was high on many lists, last season, as a strong sleeper pick coming out of the draft. Unfortunately, the Lions had different plans. Abdullah would start games with a big run or a string of big downs, but then he wouldn’t see a single rush or target his way again. Theo Riddick was actually getting Woodhead-esque work as games progressed, finishing the season with 80 catches on 99 targets. If the Lions want to find balance though, they’ll want to had the ball off to Abdullah. 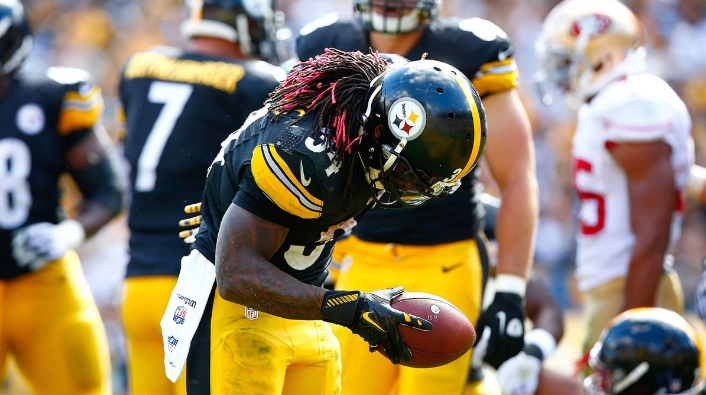 I would highly recommend handcuffing DeAngelo Williams with Bell, or stashing him in the case that he has to be a starter again. 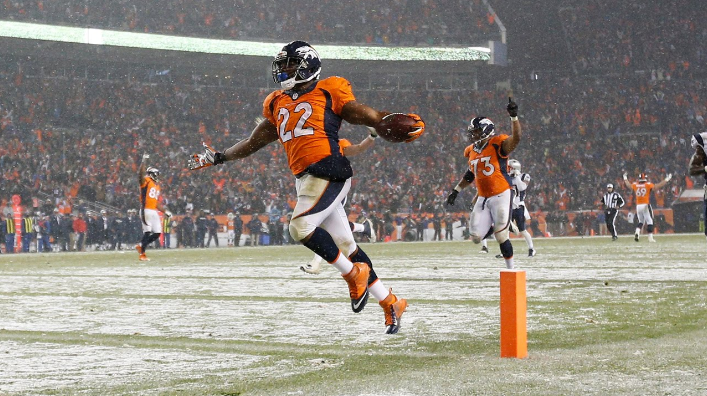 In just 10 starts, Williams tied the league high for rushing touchdowns and totaled 1,274 yards from scrimmage. There isn’t much reason to put much stock in Melvin Gordon, but the Chargers are giving him every chance to bounce back. They were never totally healthy at offensive line in 2015 and they could be poised to get ahead of teams early on, capable of controlling the pace by handing off to Gordon. If he’s the starting running back in San Diego, he’ll have more value than most running backs in the league. 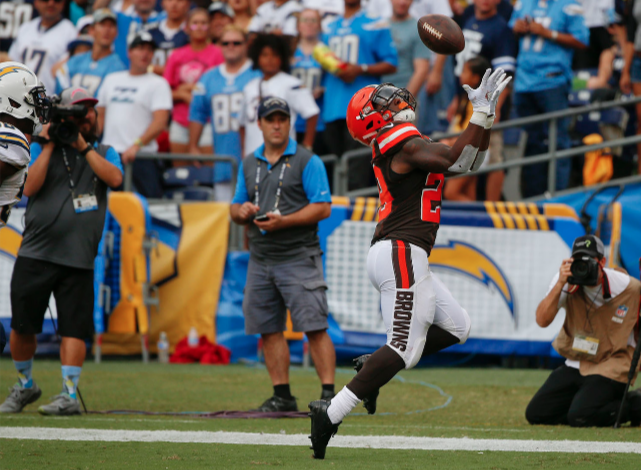 Duke Johnson Jr could very well be Hue Jackson’s new Giovani Bernard. When he received more game reps, Johnson became a strong PPR threat and finished with 61 receptions. The Browns may be playing from behind a lot in 2016 and that gives him a significant edge over Isaiah Crowell. 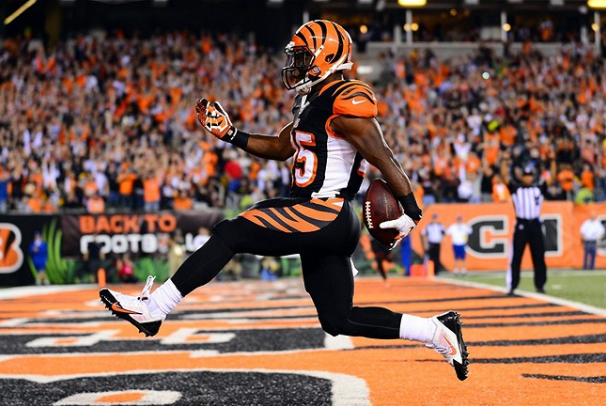 Gio Bernard recorded a career high in rushing yards, but had most of his touchdowns “vultured” by Hill. It was clear that Bernard is a better running back and he is capable from scoring from anywhere on the field. After the recent departures of Andy Dalton’s #2 and #3 receivers, there’s a good chance Bernard could be spreading out more as well. 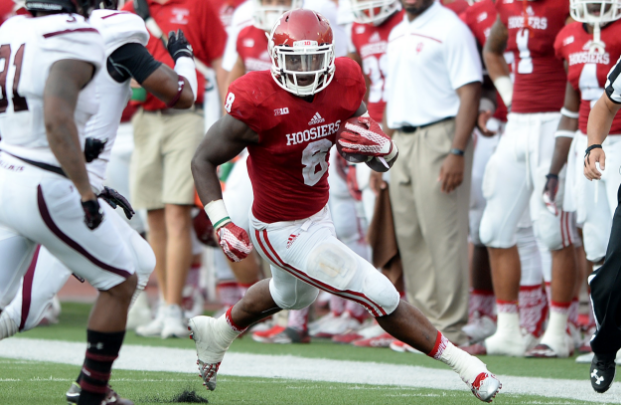 I include Jordan Howard here because there’s a possibility he breaks Bears training camp as their #1 running back. It will be a volatile situation, more than likely, but Howard possesses the size, speed and ability that could win the starting job…or at the very least, get plenty of opportunities in the red zone. Bilal Powell could be a huge sleeper this season, as he showed to be a PPR stud down the stretch in 2015. After returning from injury in Week 10, Powell averaged 5.3 catches per game. There’s also no telling how Forte will hold up for the whole season and Powell has a much better nose for the end zone. 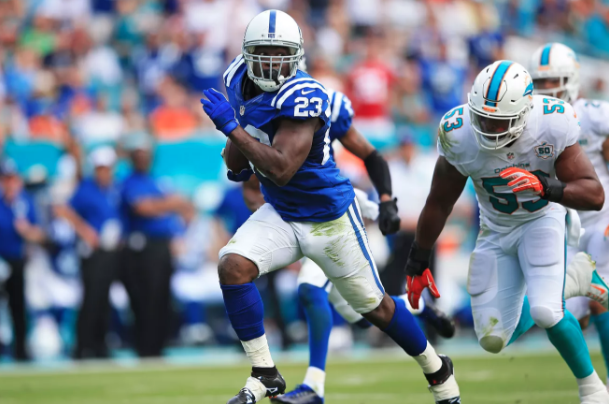 Right now, Frank Gore is the #1 running back in Indianapolis but how long does 33-year-old running back have to maintain that role. 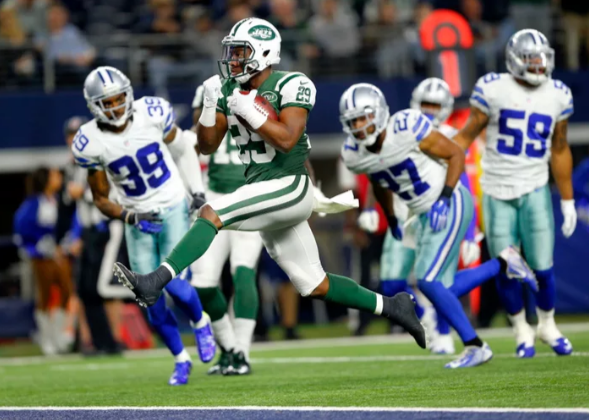 In 2015, Gore finished with the lowest amount of rush yards after completing a full 16-game season and his 7 touchdowns were recorded in just 5 games. 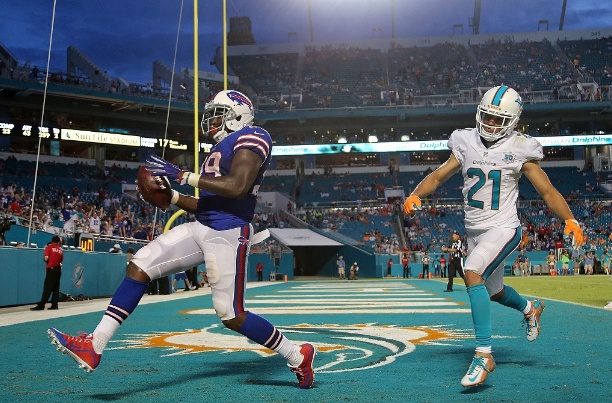 Remember when Karlos Williams scored touchdowns in each of first 6 games? 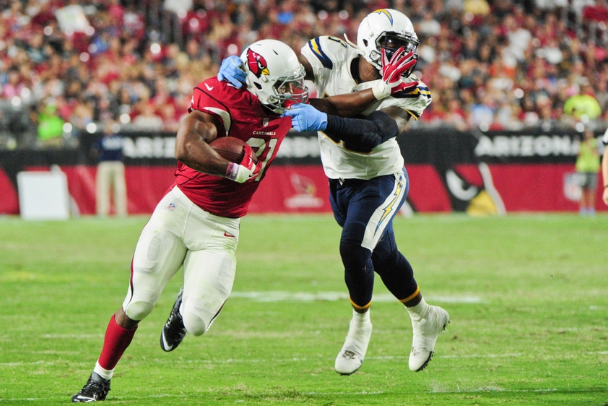 That was awesome…Williams is another player to keep close, with strong possibilities that McCoy goes down. He also seems to get plenty opportunities in the red zone, regardless of McCoy’s health status, but dealt with the injury big himself in his rookie season. Chris Ivory tied for the league lead in carries within the 5 yard line and finished with career highs in touchdowns (8) and rushing yards (1,070) and for the season. Now he’s in Jacksonville, likely to split carries with Yeldon and running in an offense that tends to play from behind a lot. That could see the workload he earned in 2015 for his first Pro Bowl diminish quite a bit, but there’s potential for Jacksonville to be in his sweet spot (5 yards out) a lot because of the passing game. It’s hard to leave the Heisman trophy winner off the list, especially when the running back ahead of him had such a disastrous 2015 season. Henry is a total workhouse too, who gets stronger after every run. Although the Titans invested a lot to acquire Murray, Henry could be getting plenty of carries in the red zone and could earn more reps throughout the season as well.